I bought this today at Lowe's on clearance. 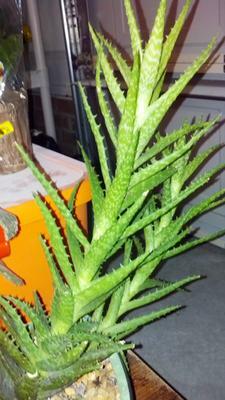 I suspect that it is some sort of aloe, but I am not sure. Any idea what it may be? Hi Kelly, there are two very similar Aloe, one is called Aloe juvenna, and the other is Aloe zanzibarica; both have the prominent teeth and spots, and this typical growth habit, spiring up into a pagoda shape, with many arms originating from a central clump. 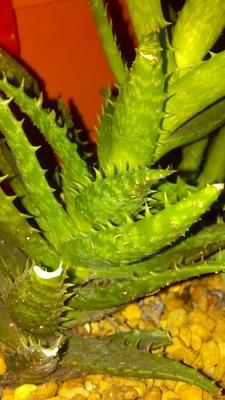 You can see more about these here: Aloe plants and Aloe succulent plants. These are great smaller species, and make excellent house plants for a bright window. As an added bonus, they're easy to propagate and keep compact by 'unscrewing' the tips of each arm for a cutting, and then the bottom part of the arm will grow bushier and fuller.